I first came across the concept of ‘to-fish’ thanks to the awesome Club Mexicana who’ve been serving up incredible vegan mexican food in London for a number of years now. My version uses seaweed seasoning and polenta to create crispy pieces of tofu deliciousness that taste exactly like fish fingers! These are the sides I like to serve it with but by all means use your favourites. 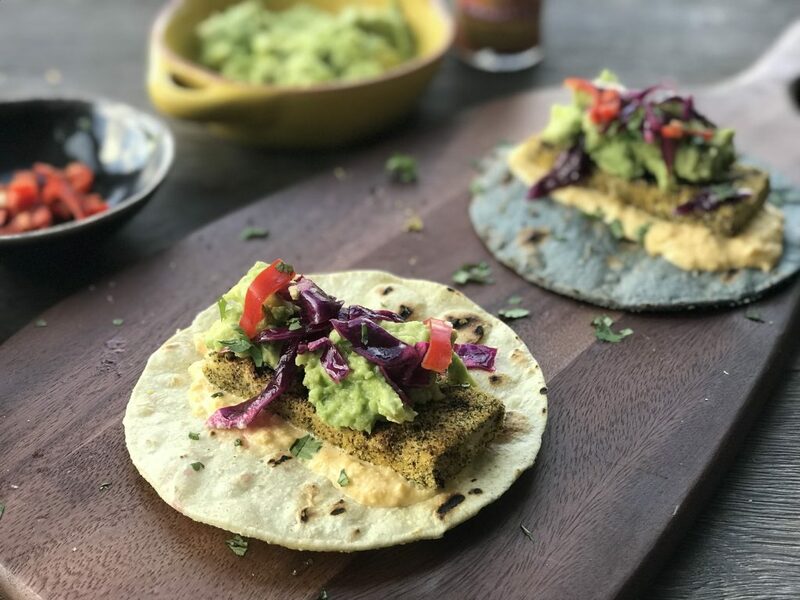 Vegan tacos? Yes please! For the sweetcorn sour cream, pour boiling water over the sweetcorn in a saucepan and put the lid on until thawed. Put it in a food processor, add two generous tablespoons of vegan yoghurt and the juice of half a lime. Season with salt and paprika then blitz to your ideal consistency (I like it quite smooth so leave it for at least a minute). First make the toppings. Mash the avocados with lime juice, season with salt and place in the fridge. Don’t worry, the lime juice will keep it from going brown. Make the slaw by slicing the red cabbage and mixing it with a drizzle of oil, a squeeze of lime and a sprinkle of salt. Now for the To-fish. Take the Tofu and wrap it in kitchen roll. Squeeze it gently to get as much moisture out as possible but don’t let it break apart or lose its shape. Slice it into rectangular slices about a centimetre thick. In a bowl, combine the polenta (uncooked) with the seaweed seasoning (this is what’s going to give it that fishy flavour) and a pinch of salt. In another bowl combine the corn starch and warm water. Mix it well, this is your egg substitute. Take your strips of Tofu, dip them in the corn starch and then toss them in the polenta and seaweed mixture until they are completely covered. Heat a griddle pan or a frying pan if you don’t have one. Warm your tacos (I used a combination of standard corn and blue corn which are great) and set aside. Heat a drizzle of oil in the griddle pan, on a medium heat, and fry the tofu strips on each side for about a minute. You should get a crispy crust and lovely char marks along your To-Fish pieces. 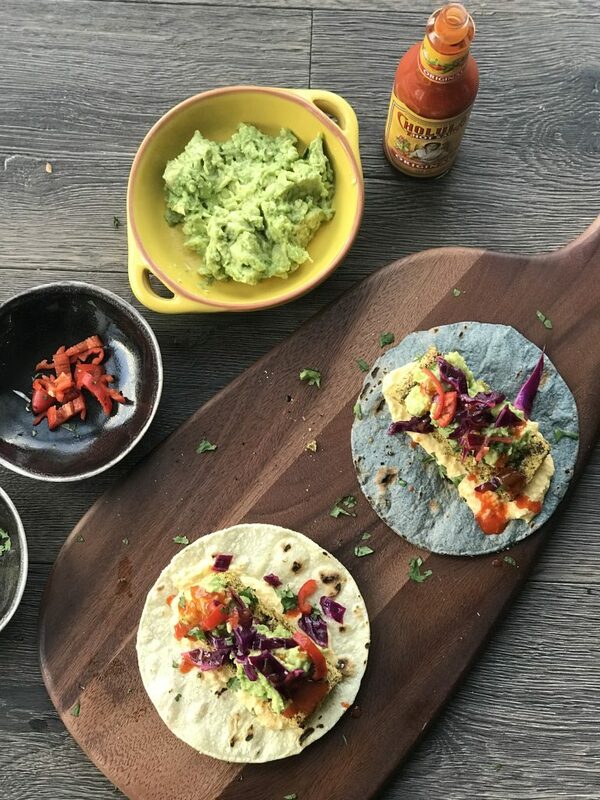 Assemble your tacos with a dollop of sweetcorn sour cream, to-fish, smashed avocado, cabbage slaw, chopped chilli and coriander and then drizzle over your favourite chilli sauce. BOOM! For more epic Veggie LAD recipes click here.